Do you have a cat that wants to go outside or do you want to enrich your cat’s environment? You may have observed stress behaviors like pacing, scratching furniture or rugs, intercat aggression, increased vocalization, excessive grooming or urine marking. Dr. Elsey's Precious Cat Touch of Outdoors with natural chemical free prairie grasses grown in their fields can help your cat feel less anxious, bored and depressed which translates into a happier cat environment. Touch of Outdoors has natural chlorophyll for odor control and no airborne dust. Bring the outdoor experience in with Touch of Outdoors Litter! Each box has a free Litter Box Solutions Booklet. Chemical free prairie grass helps your cat feel less anxious, bored and depressed. Natural chlorophyll for continuous odor control. 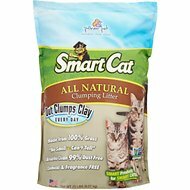 All-natural hard clumping litter, no airborne dust. Works with sifting/mechanical litter boxes. I have no complaints about this litter and the price is reasonable, however I was expecting it to have a weight and texture somewhat similar to grass-based litter. The name implies that it is at least partially grass, but it is not. I have not used clay litter in years for several reasons and that is what this litter is. But for a clay-based litter I give this one high marks. It is very low dust, does not have that funky smell when the kitties urinate in it and it is fragrance free. It clumps well and tracks about like any clay litter but the granules are much larger. It is not a sand-like litter. If you use clay litter I would recommend it. I have 25 plus kitties. I brought in a feral foster kitten to socialize him. He didn't want to use the 2 other brands of litter the the other kitties used, so i researched and tried this. He immediately took to it. No more accidents outside the box. Although, it hardens like cement and can stick to the box and it's better than the alternative (cleaning messes outside the box). I'm happy and I'm sure he is too! 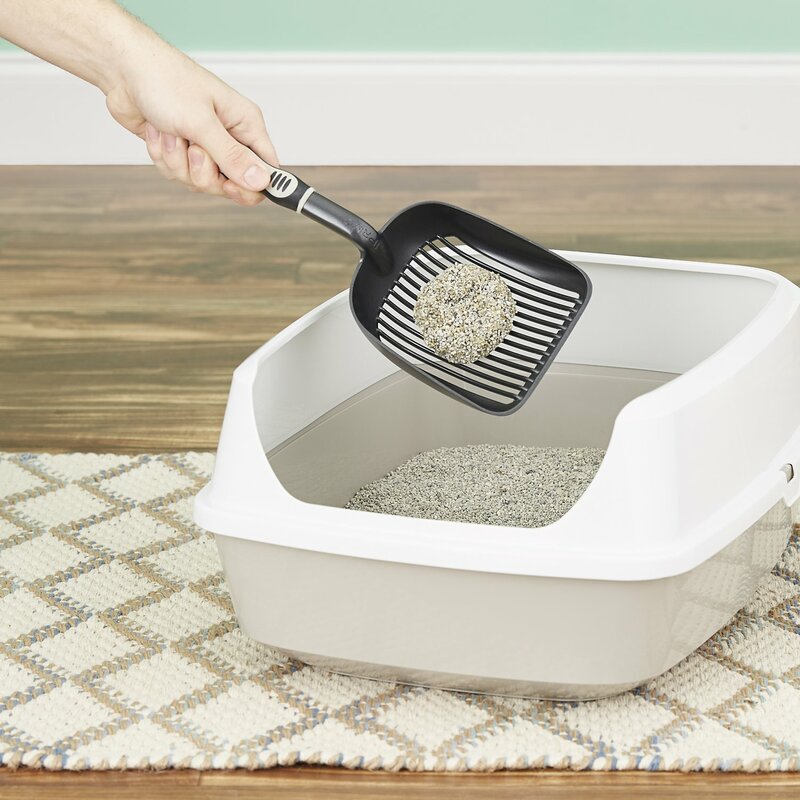 Tried this litter with a cat who has stopped using the litter box for no. 1, and it worked. Two years ago, he was rescued from an overcrowded barn cat situation and had done fine with the litter box until about a year ago. After multiple vet checks for UTI/crystals, we tried this litter since he used to live outside, and he has been using it successfully for several days. Hope this is the solution. 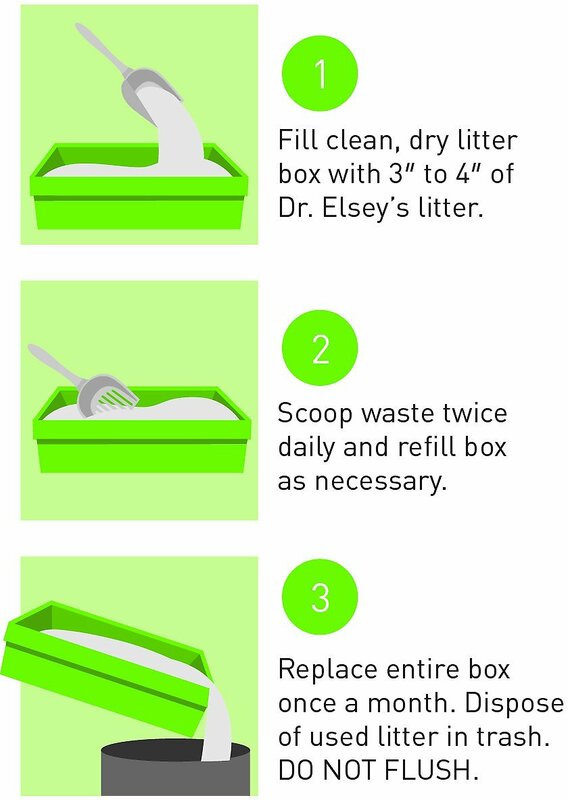 I recently switched from Worlds Best litter to Dr. Elsey's, after my two cats suffered a bad reaction to the former litter. After reading reviews on the Touch of Outdoors formula, I decided to try it out. As soon as I put it in the litter box, my youngest cat used it without any problems at all. It clumps very well and (if you put the correct amount in the box) it doesn't stick hardly at all to the bottom of the box. I also like that it is fragrance free, which is wonderful if you have breathing issues. Finally, the booklet that comes with the litter was very useful, with lots of tips in it. I highly recommend Dr. Elsey's litter. I was using this litter exclusively for at least a year. It used to control odor. Now, it stinks to high heaven. And I clean my boxes daily. It now does more than clump. It turns into cement. It's sticking to litter pans, even though I spray the bottom with cooking oil. It sticks to the scooper. It clumps and stick to my longhair cat too. I find clumps of litter all over the house now. Sadly, whatever changes they have made to the formula a couple of months ago have made this litter completely useless. Way too expensive for the stench and cement like qualities it now has. The litter was a great deal and I made a spur of the moment decision when I saw field grasses as ingredients. I read the back where it states clay too, but missed it and ordered ALOT of it. This was completely my mistake and I won't use clay for my kitty. Return was quick and easy and fully refunded for all bags! I will use Chewy again because of the return process! This is the BEST cat litter ever!!!! I have a very finicky cat who will not use the litter box unless it suits her. She has used the box consistently since I got Dr. Elsey's! The litter clumps tight and quickly. The litter is not dusty and does not get tracked outside the box. GREAT clumping & NO FUSS! LOVE IT! Best clumping litter I’ve bought. LOVE it! We have 4 indoor cats & they use 3 litter boxes full of litter, I know what I’m talking about. This stuff ROCKS!!! I'm not a big fan of this product because it's very heavy and neither scoops as well as my usual product nor does it have any natural odor control like my usual product. All that being said one of my cats is a TNR feral I fed outside for 12 years who suddenly made the decision to move into the house a year ago. She prefers this litter because it's more like outdoors. I tried this litter but it is very dusty. It tracks all over the floor and being at it is in my bedroom I find it there also. I have one more to try but will wait before feedback is given.